A problem with the Sieg X2 mini-mill [HF 44991, Grizzly G8689, Micro-Mark & others] is that the head can suddenly drop down while you’re milling. Everything will seem fine until the head suddenly drops a bit, which causes the end mill to try to cut too much metal at once, causing the table to start shaking as much as the play in the gibs allows. When you finally hit the power switch and raise up the head you find that there is a big gouge in your workpiece. This article discusses why it happens and how to prevent it. The problem occurs because the X2’s head assembly moves up and down on the column to control the depth of cut. When you lower the head with the fine-feed knob you cause the pinion gear in the head assembly to push against the underside of the teeth on the rack, which is mounted on the column. It pushes on the underside because there is a torsion-arm type spring on the left side of the mill that is trying to support the weight of the head by pushing upward. Without this spring, the head would crash down on the table if you let go of the 3-arm wheel for making quick/course height adjustments. It won’t drop if the fine-adjust knob is engaged because a worm gear prevents that from happening. The design of the spring is not very good. It does not provide a lot of upward force, especially when the head is located near the top or bottom of its range. But, with a little help from the friction in the column and spring mechanism, it does a pretty good job holding the head in position MOST of the time. However, sometimes it just barely supports the head enough and that is what causes our problem. Allow me to use an analogy. Imagine that your body is the milling head. You’re standing on a spring that can barely support you, and you have to adjust your height above the floor by pushing down from the ceiling. Now imagine that a strong hand reaches up out of the floor and pulls you down until your feet contact the floor. Well, an end mill can sometimes grab enough to pull down the head assembly. Especially, it seems, when you’re milling an edge. I believe that vibration from milling also helps by overcoming some of the friction in column and spring assembly. The head is going to drop down until the pinion gear is stopped by the tooth on the rack just below the one that the gear has been “pushing down” from. The distance it drops depends on how fully meshed the rack and pinion teeth are. If they are fully meshed it won’t drop much, if any. However, if the teeth are just starting to mesh, then the head can drop down almost the distance between the teeth on the rack, which is .1250-inches or 3.175 millimeters. There are a number of ways you can prevent or work around this design flaw. 1) The easiest way is to always lock the Z-axis after adjusting the height of the head. Just turn the little lever located behind and a little below the 3-arm quick/course adjustment wheel. 2) Lower the head beyond where you want to make your cut. Then move the head in the upward direction only until you are at your desired height. This means you may have to use your graduated dial, a DRO, or a dial indicator. Going back to my analogy, when you crank the fine-adjust knob to lower the head you do it by “pushing against the ceiling.” But when you turn it to raise it, it is as if your feet are already touching the floor so the head can’t drop any lower. 3) You could replace the stock spring with something better. If the spring was stronger, the head couldn’t move down while you’re cutting. So a popular modification is to replace the stock spring with air-lift struts, like the ones sold by auto parts stores to hold up the hood or rear hatch of a car. You can buy a kit if you don’t want to design and make your own. Some have replaced the spring with a counter-weight that is usually located behind the column or hidden under the workbench. It is connected to the head by a cable and pulleys. 4) You can also disconnect the stock spring altogether. Without a spring, gravity will cause the pinion gear to rest against the top of the teeth on the rack instead of “pushing down” from underneath them. The head simply won’t be able to drop down any more. This method also gets rid of most of the backlash in the Z-axis. However, the head won’t be as easy to raise without the spring and it will come crashing down if you let go of the quick/course adjustment wheel. That would make it hard to use the mini-mill as a drill press. It is not hard to disconnect and reconnect the spring and you might be tempted to do so, but I suspect that sooner or later the bolt might go flying into someone’s face or you might get your fingers pinched. I have an X2 and certainly recognise this problem. At present I opt for clamping the Z axis and when using fine down-feed I use a DRO as I got messed up by the backlash too many times. I also find that this design flaw causes drill dig-in when progressively opening out holes. The easiest way around this seems to be to “push against the ceiling” while using the fine-feed. A bit tedious! I’m wondering whether air lift struts would have enough lift to prevent this. Anyone got an opinion? Yes. It’s costs about $40 and is suppose to be pretty easy to install. It’s one of the most popular mods for the mill, although I haven’t installed it yet. I arrived at essentially the same analysis and solution about a year ago. My solution was to install a 100 lb. (force) air spring, which forces the head up, taking up all of the play in the Z-axis mechanisms. 2) Apply UPWARD force with the DP handle while unlocking the Z-gib. 3) Maintain that upward force while turning the fine-feed knob clockwise to bring the head down to cutting depth. 5) Let go of the DP handle (whew!) and make the cut. 6) Z-gib is still locked. Re-apply the upward force with the DP handle and take up any slack that may have developed in the fine-feed gear train using the knob. 7) Maintain the upward force and unlock the Z-gib. 8) Go to step 3. It’s tedious, but it works. A very well written and interesting article. Thank you for taking the time to assist others, like me, who are considering a Mini-Mill. Another solution, that springs to mind, is to add another rack gear or slit the existing one and mount alongside and tension one against the other. This is a classic way of removing backlash. You could add a belleville washer too to make it smoother. Often anti-backlash gears have two pinions side by side with a spring torquing them together so that’s, yet, another possibility. I’d be interested to know if there is sufficient space and features which would make the twin rack suggestion possible. The answer might influence my Mini-Mill purchase decision. Finally, I’ve talked to UK suppliers of many many Mini-Mills and they say that they hear of few problems of ‘head dropping’ so maybe some folk just get used to a set operating procedure as a work around. How about replacing the spring arm/gas strut/counterweight ideas we’ve seen with a cable drum on the DP handle, with the right counterweight the handle will be providing the lifting force to counterbalance the head weight, less counterweighting will be needed because of the mechanical advantage the rack and pinion gives (depending on the diameter of the drum), and the pinion gear will held be in contact with the top surface of the rack teeth at all times? This won’t help snatching during drilling with the DP handle, as the required force may overcome the head weight resulting in the pinion passing to the underside of the rack teeth, but with a speed handle on the fine feed this may be OK? I too faced the same problem using my Sherline mill. What Rob suggested of feeding downwards and moving up again is by far the best method for small mills…I have been doing that since. The mill finish is great also bear in mind all axis x and y must be locked. The moving axis must be snug for feed movement only. I to have dealt with the “head drop” with the instillation of the LMS. Took about 1.5 hours and has limited but not eliminated the problem. I still lock the head before milling and have modified a Harbor Fright Digital hight gage for Z reed out. I have faced same problem in my mill. To fix that problem in proper manor it took around 3 hours. After that I will replace lots of old part with new one to avoid such problem again. Using original parts of machinery increase their life and restrict such problems. hi that not the only problem with yhe x2 and sx2 the whole system of the drill mill stems from the rack right through to the fine feed (sudden drop) check out yahoo x mill site there is a section in the image section which totaly explains the problem and how to get over the problem take the spider wheal for instance the castle nut drive ,,,to check for slop in this drive ,,, lock the gib screw for the head then move the spider wheel you might find there is around 25 thow slack between the castle drive nut ,,, you might fix some of the rack problems lumpy rack head dropping and silly things like that ,,, thats only part of the problem. if you dont sort the whole drive train out you are no better off ,,, the engineering of these machines is verry poor ,,, take a look at yahoo x_mill group i have put full instructions on how to eliminate 99% of the problems ,,, the instructions are under the name barney g1fak they are in two parts and about 60 od pictures and some of the remedies you might not want to attempt a little dificult you will also find a full write up under the picture bar ,,, one other thing do not fit overpowered gas struts (reason) you will be causing undue pressure on the vernier adjust drive you solve one problem and create anotherthe head weighs around 14 pound and you require a gas strut a couple of pounds more . if you can find one! I’ve found that most of the issues with the X2 and SX2 mini mill can be solved install DROs on each axis and locking your gibs before cutting. When you’re directly measuring the table’s and head’s position, none of the backlash in the system matters. Okay so I have solves most these issues with barely anything. Here we go! #1. The strip gear on the column.. do what it says up top, take your torsion arm off ( just the bolt) drop head all the way down. Take the strip gear of held by 2 fhcs’s. Make some shim to go behind there mine took 0.020. I just used sheet shim cut a strip and punched two holes so it can be held by the to flat top bolts wile assembling. This moves the strip gear forward taking a good amount of the lash out. #2. Castle gear meshing. On the course feed nob, take snap ring off slide the nob off watch out for a little steel ball that will fall out and the keyway. Now unbolt the fine feed parts. 2 bolts up front by nob and 2 by the main gear bar. Take the worm castle gear out. Take the 3 bars off the course nob ( this makes things easier). Take the course nob and your worm castle gear and feel how they mesh, see how much play you have. Now the goal is to make these tighter. Many of you think, well you need to add material to do so. Well not necessarily, we just need to move some. Now on the worm castle gear ( this works the best clamping in bench vise) set it so your teeth face upward. Take a flat sharp punch and line it up on one tooth at a time with the flat of your punch going from center outward. Line up right in the center of a tooth and smack it. (Start soft and watch how easy this is) but one hit at a time watch as the tooth will widen. Do this all around then file fit it with the other castle gear (course feed nob). I got mine to the point of no lash at all, so take your time file a little and see where your at. You should only have to punch the teeth on one gear not both! You will take your self backwards. #3. Fine feed worm gear meshing. Simple take the part that bolts to the back of your head (it holds the worm castle gear inside). Its held by those two bolts, now just notch the 2 holes up a little so when you bolt it back on ( dont forget your worm castle gear) apply downward pressure as you tighten and this will mesh these gears up better, taking a lot if not all the lash out there. #4. U Joints from fine feed nob to course feed nob. Now this is also simple get some .005 shims and cut a small u out and shove those in the gaps of the U Joints. Done! maybe some tape or heat shrink to keep from falling out. #5. Keyway on main gear shaft for course feed. Also simple make a darn key that actually fits! Take your time but mine had one that was .150 wide about .1555 tall and .775 long. The one I replaced this with was .1585 wide .175 tall and .7785 long. Just to give you an idea on how poorly fit the factory key was. Now do all this taking your time, I promise you’ll have under a thow of backlash through the hole Z axis system. This fixed my head drop issue and im still running the torsion arm. Air strut is already on the way cuz i do want more travel. Cheers! Concerning axial movement on the worm gear. I haven’t taken my year old mill apart, but couldn’t shim washers be utilized? Although your grove and ball may be okay, I’d rather shim with washers. Shimming will help, as will the LMS gas strut modification. But, it will not eliminate the backlash, just reduce it. In order to eliminate it, you need to go through the solutions posted above, or a combination of them. In my opinion, it is not worth the time and effort; just remember that it is there, and adjust your machining technique to account for it. Eliminating head drop is simple. No modifications necessary. When possible raise, not lower the head to the height desired. Lock the jibs, turn the fine feed handle counter clockwise to eliminate head drop. Sometimes it is not possible to raise the head to height, lowering the head is the only option. In this case lower the head ,lock the jibs and remove backlash in the fine feed by turning the handle counterclockwise. You usually can keep the backlash to .0001 or less if the cuts are light. Sometimes the cutter can pull down in a end mill holder. When installing the end mill ,pull down til the flat spot on the cutter hits the set screw, then tighten set screw. 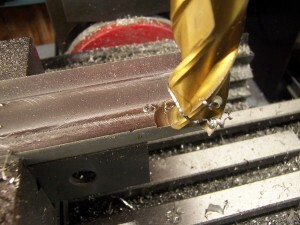 This method should take care of head drop on any mill drill or milling machine without a knee. Try this method before modifying your machine.